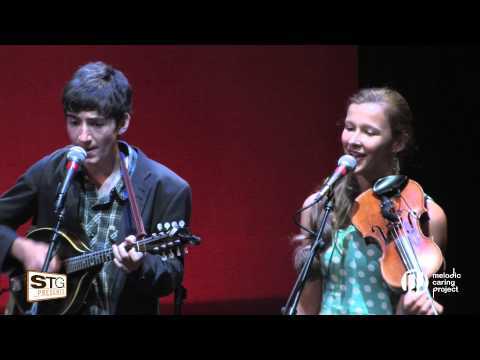 The Onlies are a group of three teenage musicians from Seattle. They just released their first recording, Setting Out to Sea, which is an enjoyable mix of traditional fiddle tunes and their own compositions (including both instrumentals and songs). Traditional tunes are from Scotland, Ireland, Cape Breton, Quebec, and America and those styles are reflected in their own compositions, while their songs have similarities to early Nickel Creek. The band members are Sami Braman, Riley Calcagno, and Leo Shannon, who are sophomores in high school and have played together for most of their lives. The Onlies have performed a lot of gigs recently, including a tour of the West Coast last month. The tour started with a house concert in Portland, Oregon; then in California: Rio Dell; Berkeley; Cottage Grove and a contra dance in Palo Alto. While in California, the three of them spent a week at Alasdair Fraser’s Valley of the Moon Scottish Fiddling Camp in Santa Cruz. Unusual for many bands, but a really excellent training ground for traditional musicians, The Onlies regularly play square dances in the Seattle area. The three have different stylistic preferences: Riley’s favorite style is old-time music, Leo’s is Irish, and Sami’s is Cape Breton. Yet they blend those styles into a very coherent mix, which they describe as “original and traditional fiddle tunes from Scotland, Ireland, and the Americas.” All three play multiple instruments, but everybody sings and plays fiddle. In fact, track 1 features all three simultaneously on fiddle. Throughout the rest of the CD, Riley also plays guitar, mandolin, banjo, and piano, while Leo is the main guitar player, but also plays mandolin on some tracks. Setting Out to Sea features 14 tracks. My personal favorite song on the album is Far From Danger. It stays fresh no matter how many times I listen to it. The song has a bit of a bluegrass feel to it, yet there suddenly is a very Scottish sounding fiddle solo that fits in perfectly (played by Sami). Riley plays guitar on this track, and Leo mandolin. It is the only track where all three of them sing. Ruth Mabel Boytz joins them on bass, on this track as well as a few others, This track is a great example of how they mix styles in a coherent way. My favorite instrumental track is The Sisters’ Set. This is the most Cape-Breton sounding set on the CD and features three tunes; the first is a march written by Sami called December March (fittingly written in December), followed by traditional Cape Breton tunes: The Sisters Reel, a traditional pipe tune. On this track, Sami plays fiddle, Riley plays piano, and Leo plays guitar. I hope The Onlies have a chance to play in Los Angeles soon. I wouldn’t miss their concert and you shouldn’t either.